Accidents happen, especially to young children. Any parent will tell you their little ones are always falling over and bumping into things, scraping knees and needing band-aids. Most of these accidents will be minor, and many are unavoidable. That doesn’t mean, however, we – as parents – shouldn’t take steps to avoid them; if nothing else, an accident avoided is an afternoon without tears. This is especially true of baby gates, which some parents think they can maybe live without because let’s face it, they are awkward and (often) unsightly. They make maneuvering around the home a challenge, especially if you have older children who don’t need them and, depending on the design, can end up damaging walls and floors. However, given that over half of children under the age of one who end up in the emergency room are there because of a fall-related injury, it’s probably a good idea to have them fitted, especially on staircases and the doorways to places such as the kitchen and bathroom, where the risks of injury are higher. In fact, installing baby gates is probably one of the first things you should do, even before the baby arrives, as they can protect your child when they’re crawling as well as walking. Which, though, is the best baby gate for you? Here, we’re taking a detailed look at the Summer Infant Multi-Use Deco Extra Tall Walk-Thru Baby Gate; it’s key features as well as it’s pros and cons, alongside those of other baby gates on the market to help you decide which is the best fit for your home and your lifestyle. First, though, we’ll look at the different types of baby gates available and what you need to look for before making a purchase. 7 Which is the better option? 8.1 Given the design, which bit of the gate is 36” high? 8.2 Does the gate open all the way, lying flat against other gate panels? 8.3 Can the gate be left open? 8.4 How wide is the gate opening itself? These gates fix onto walls or doorframes using screws. They tend to be sturdier than pressure-mounted gates (see 2.) and are generally recommended for the tops of staircases as they aren’t likely to come loose if a child (or adult) falls against them. Another plus of hard-mounted gates is they don’t have a bar at the bottom (pressure-mounted gates do), so they aren’t a trip hazard. However, not all parents like them because they leave marks on walls and doorframes when they remove them. These gates don’t leave any marks once you remove them because – as the name suggests – they rely on pressure to hold them in place, making them ideal for use in doorways and quick and easy to install. A downside of pressure-mounted gates, however, is that they must have a bar at the bottom, which can be a trip hazard, meaning they possibly aren’t as safe as you would hope they’d be and why you shouldn’t use them at the top of a flight of stairs. These gates are made of vinyl or fabric and slide out of the way when they aren’t in use. They do require hardware to be attached to the walls, but the use of flexible material means they are much less obtrusive than concertina style gates. While retractable gates aren’t necessarily robust enough for everyday use, they’re great for areas that you don’t need to close off all the time or a grandparent’s house; plus, they’re safer than freestanding gates. To find out more about retractable gates, check out our review of five of the best here. These gates tend to be used as a temporary safety measure when parents are out and about or traveling; they also work well in a garden if you need to keep your child in a specific area. While these are light and portable, they also come away from walls or doorframes easily, meaning it’s hard to leave your child unsupervised, even for a few minutes, when using them. While you might assume that all baby gates will be built to the same minimum standards, this isn’t the case. However, the Juvenile Products Manufacturing Association (JPMA) has clear guidelines and minimum standards on baby gate manufacturing designed to make sure you and your baby are safe. Look for baby gates, therefore, that are JPMA approved. Baby gates generally have slats, which the baby can use to pull themselves up on a allow you to see your baby if they are in another room. There should be 3 inches or less between these slats, anything wider and your child’s head could go through, leading to injury (including strangulation). It’s worth mentioning, too, that older models used to have an accordion design. These are just as dangerous as those with slats too far apart so if you’re offered this type as a hand-me-down, it’s wise to say no thank you. Ask yourself, can you open and shut the gate quickly and easily? Some pressure-mounted gates, for example, require you to move the whole gate each time you want to get passed, which won’t work if you need to get in and out a room several times a day. Look for gates that you can open with one hand (so you can still keep hold of your baby if you need to). Think about how the gate opens as well: does it swing inwards or outwards or does it fold in on itself concertina style? Where you have the gate and how often you’ll use it will impact choosing the style of opening. If, for example, you have a baby gate at the top of the stairs it will need to fold or open inwards (towards you) as opening outwards (away from you), is a risk as you could fall forward. While you want the gate to be easy for you to open, you don’t want your baby or toddler to find it easy as well. Look for gates that have excellent locking mechanisms, ideally ones that lock the gate automatically or which have an alarm that lets you know if the gate hasn’t close properly. Depending on where they are in your home, there’s a good chance that you’ll open and close your baby gates multiple times a day. Plus, they’ll have a baby or small child pulling up on them in an attempt to get through to whatever is on the other side (which is, no doubt, more interesting). Make sure, therefore, that the gate you choose is made from materials that can withstand the wear and tear and will last as long as you need it to; gates aren’t cheap, and you don’t want to be replacing them within a year. Remember, whichever style of gate you pick, you’ll need to measure the space the baby gate will be in correctly. Gates tend to come in standard sizes, and if your door frame is wider, you’ll need to buy extensions, which are available for most models; if the door frame is smaller, you may struggle and only be able to choose from a limited number of baby gates. When you’re getting ready to fit your baby gates, it’s a good idea to take a look around and make sure there isn’t anything your baby can use to grab onto to lift themselves over the gate; the same goes for potential footholds. If there are any hazards, remove them before fitting the gate. 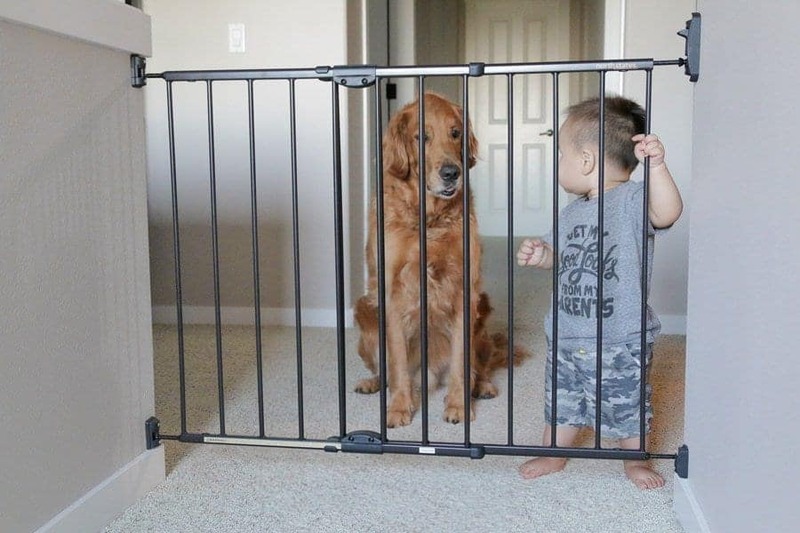 Ideal for babies and toddlers aged six months to two years, the Summer Infant Multi-Use Deco Extra Tall Walk-Thru Baby Gate is a 36” tall, pressure-mounted, baby gate. Designed to fit openings between 28.5” and 48”, it has dual locking and auto-close mechanisms to help keep your baby safe. The gate, which is available in beige and bronze (as opposed to the standard white design you get with many baby gates), has narrow slats and an arched opening, making it attractive as well as functional. Plus, it’s JPMA approved, meaning you know the design adheres to rigorous safety standards. Because it’s a pressure-mounted gate, it does have a floor bar, which you’ll need to watch to reduce the risk of trips and falls. However, thanks to the optional hardware (included with the gate), you can use it on the top of the stairs, which isn’t the case with a lot of pressure-mounted baby gates. Summer Infant also provide a stopper to stop you opening the gate outwards at the top of the stairs. Pressure-mounted so comes with a foot bar which could present a fall/trip hazard. The opening isn’t that wide, though the gate can fit gaps up to 48”; this can make getting larger objects through, e.g., furniture (without having to remove the gate first). If not opened fully, the latch can catch, causing slight scrapes or snags on clothing. This pressure-mounted gate was designed with looks in mind. Made of black metal with cherry wood accents, it’s easy to fit and take down when it’s no longer needed. However, this does mean it can’t be used everywhere in the house, the top of the stairs for example; if you want to do this, you’ll need to use the added hardware mount. You’ll also need to be careful as it doesn’t allow you to set it only to open one way. Not ideal for use at the top of the stairs; while it has hardware that can be used to secure it to a wall or door frame, there is nothing to stop the gate opening outwards (away from you), which is a safety risk. Another pressure-mounted baby gate designed to fit into wider openings (up to 51.6”) if needed, the Munchkin Easy Close XL Metal Baby Gate is JMPA certified and offers a range of safety features including an optional third base lock that allows you to set the gate to open only one way and a push open/close latch. However, it doesn’t come with added hardware, meaning it isn’t ideal to use on the top of the stairs. While all the gates we’ve looked at are in the same price range, it’s hard to beat the Summer Infant Multi-Use Deco Extra Tall Walk-Thru baby gatebecause of all the added extras. Not only is it JPMA certified, meaning you know it meets minimum standards designed to keep your baby safe, it has built-in safety features that mean it can be used anywhere in the house, including the top of the stairs (as long as you’re careful with the foot bar). Where it possibly isn’t as strong is in the looks department. The bronze version has more character than the beige, but it does tend to lose out here to the other brands/models we looked at, which were more striking. Another area where it isn’t as strong is the size of the opening, which is narrower than the other two gates, meaning you may struggle if you decide to move furniture or other large items between rooms. Given the design, which bit of the gate is 36” high? The top of the arch on the gate is 36”, the rest of the gate is 33” high. Does the gate open all the way, lying flat against other gate panels? No, it does not open all the way. Can the gate be left open? No, the gate swings shut once you let go. How wide is the gate opening itself? The gate opening is 19” wide. The Summer Infant baby gate is a great gate that does what it says on the tin and then some. It has been designed to minimum safety standards and has built-in safety features which means your baby or toddler will be safe, secure and at less of a risk of slips, trips and falls than they might be otherwise. And, while the gate isn’t as attractive as others on the market, at the end of the day, while looks matter, for us, they will always take second place to the safety of our children, meaning of the gates we’ve looked at today, the Summer Infant Multi-Use Deco Extra Tall Walk-Thru Baby Gate would be our top pick. The Hatch Baby Rest Review You’ll Have to Read!